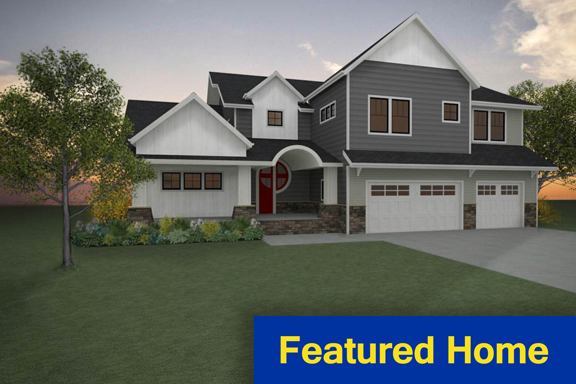 Luxury Custom Homes presents a modern Craftsman custom home within Rocking Horse Farm in south Fargo. This open-concept floorplan has many unique features including a one-of-a-kind European-inspired custom front door. The 6,700-sq.-ft. 5-bedroom 4-bath home features a chef’s kitchen, stainless steel cooking island, custom cabinets, finished basement designed for family and entertaining, plus a great room that houses an indoor swimming pool and jacuzzi. This is a Luxurious Featured Home. Cost is $5 to tour all three Featured Homes with proceeds benefiting Home Builders Care of F-M Foundation.